Jack (O’Brian) is a former private detective but now a kickboxer living in Indonesia. Life can take some pretty strange turns. Things get even stranger when an evil criminal mastermind named Foster (Hamel) appears on the scene. Jack, in his spare time, loves nothing more than to spend time with his beloved family - his wife Lily (Pudjiwati), his brother-in-law Leo (Hosada), sister-in-law Linda (Patsy) and especially his blind daughter Fiona (Amir). Because Foster sees how awesome a kickfighter Jack is (and, to a lesser extent, Leo as well), he dreams of a day when he can enlist them in illegal, underground Hong Kong-based boxing tournaments. To achieve this end, Foster has his goons kidnap Fiona. BIG mistake. You’ve stupidly unleashed the awesome power of JACK. Henceforth, Jack proceeds to annihilate an army of acid-washed antagonists as he fights for truth, justice, and the Indonesian way. But who is the true DOUBLE CROSSER? Find out today! Another amazing collaboration of fan favorites Peter O’Brian and Arizal? Sign us up! Both men are at the top of their game in this, another hugely entertaining team-up. Shootouts, fights, wonderfully implausible situations and wacky dubbing ensue in a film that is never anything less than completely delightful. As we’ve said before, Arizal was doing this all on his own - no budget, no CGI, no real infrastructure of any kind, and that adds a certain reality and insanity to the proceedings. During car chases, it feels all TOO real - like the stunt people are really risking their own lives to entertain us. Thankfully, it all works magnificently well. The world would be a different place if Arizal’s movies got wider distribution; think of the result if they came to American movie theaters at the time and had newspaper ads and eventual VHS releases. 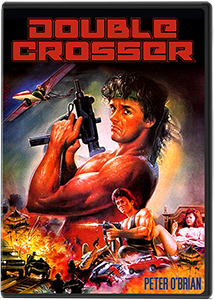 As far as we can tell, Double Crosser got a Greek VHS release and not much more. Gope Samtani’s Rapi Films never seemed to get much play here in the U.S., and that’s a shame. If only his distribution network had a wider reach, people would be wearing Peter O’Brian T-shirts today. Ah well, maybe it’s all for the better. Everything here is so great, from the baddies who REALLY know how to cover their tracks, to the disco scene with its Asian variant on “Super Freak”, to O’Brian’s Martial Arts moves and facial expressions, to the James Bond-style ‘suspended over a pit of hungry alligators’ suspense-filled finale, to the fact that there’s a character named Uncle Leo that will remind you of Seinfeld and will have you saying “HELLO!! !” like Seinfeld’s uncle, to the fact that O’Brian fights at a place called Golden Roller Boogie...and so much more. And the ending is so abrupt, it makes Godfrey Ho’s endings seem long and drawn-out. Similarly, instead of a Ho-style ‘Final Field Fight’, there’s a ‘Final Chicken Coop Fight’ where someone gets chicken feed thrown in their eyes. Like we said, another time, another place, another country. Fascinating to watch. For more undeniable Arizal fun, we wholeheartedly recommend Double Crosser. I've only recently watched THE STABILIZER last week (loved it) but saw THE INTRUDER about 28 years ago (loved that too) Watched about 15 minutes of this one, and whilst there's some chucklesome moments, it doesn't feel like a Peter O'Brian movie. Does it pick up after the 15 minute mark, does he take centre stage? The Stabilizer is better than The Intruder, but it's still worth watching. From what we remember, Peter O'Brien is in most of the movie. We saw awhile ago too. Saw this one recently too! Didn't really do anything for me though. Nothing like their other collaborations. It kind of felt like they were just going through the motions. There are some memorable sequences for sure, but as a whole, felt kind of flat. Sorry you didn't like this that much. It's hard to beat the Stabilizer for ultimate O'Brien awesomeness!